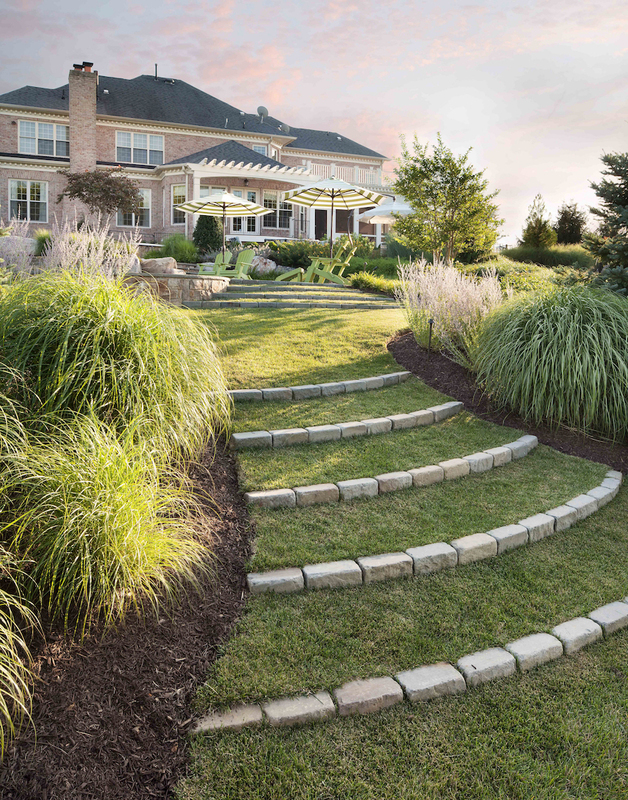 This landscape design for a swimming pool and waterfalls involved many decisions, and an intensely collaborative partnership between the Potomac Maryland homeowners and landscape architect Chad Talton. Nancy & Mark Labus had recently moved from a house on a one quarter acre lot to a new house on a two-acre lot. That house and property, though much larger, did not have a pool. They knew immediately that they wanted to put in a swimming pool. They also knew that this swimming pool would be an opportunity to design the waterfalls they’d always dreamed of. That was the starting point for the project. Another missing component at the new house was a coherent landscape design. There was only a small patio in the back yard and what Nancy called “some mish-mash landscaping with things sort of randomly thrown around the yard.” Since Mark had done the landscaping at their previous home, he felt a strong desire to bring this yard up to his standards. He saw great opportunity in this vast (compared to their old one) lot that backs up to wooded parkland. This was a big project to consider, and Nancy and Mark weren’t sure whether to start with a landscape design plan or a swimming pool design. They had a couple of plans drawn up for the landscaping, but those didn’t include a pool design. And, as regards the pool, there was a worrisome technical challenge to be faced: The yard dropped down from the house on a long steep slope. So steep, in fact, that one of the swimming pool installers who visited their property said “you’re going to need a chairlift to get yourself from the house to the pool”. 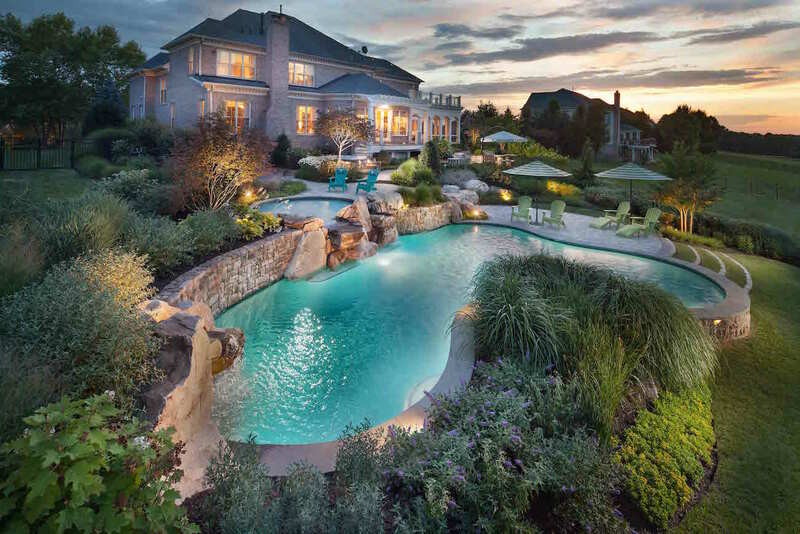 They decided they needed someone who could coordinate the entire project with landscape design and a waterfalls that smoothly integrated into the pool design That’s when they picked up the phone and called Surrounds. A few weeks later, Chad Talton was sitting with them at their kitchen table. After trading ideas back and forth for a while, Chad said simply: Tell me everything that you want. They did. And naturally, when he came back with the design, it was breath-taking. So was the project quote. Chad helped them to catch their breath and prioritize. Deleting a pool house and some of the retaining walls from the plan, brought their budget back into a comfort zone. They also replaced the idea of a fully functioning outdoor kitchen with a simple but beautiful grill station. Nancy says, “We cut the refrigerator and ice maker—all that extravagant stuff. If we’d gone with the full kitchen we wouldn’t be using it enough to justify the cost.” Their revised wish list included everything that they really needed: lush landscape design, swimming pool, waterfalls and porch. Then they added a fireplace to the porch so they could enjoy being out there during the cool season. In addition to the steeply sloping yard, there were septic fields and a reserve septic field on the property. They secured a permit from the county to relocate the reserve field in order to make room for swimming pool excavation. The ground above the main septic fields was designed as planting beds to hide the system vent pipes. To ease the steep slope Talton used planting beds, short sets of steps and strategically placed boulders to hold back earth and create multiple levels. Substituting boulders for expensive retaining walls was a clever way to hold back the hill and, at the same time, hold back the budget. This is exactly why we at Surrounds do what we do. We can all relate to the pleasures of listening to the sound of a waterfalls, plunging into a pool or huddling close to the sound, smell and warmth of a crackling fire. If you’ve been thinking about making your yard more beautiful and would like to talk about it in more detail, contact one of our landscape architects. They aren’t just knowledgeable, they’re enthusiastic.